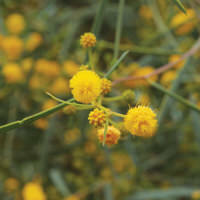 The native Australian Wattleseed is wild harvested from the continent's pristine arid regions. Wattleseeds are edible seeds that were traditionally used as food by Australian Indigenous people. They where eaten raw or cooked, or milled to a flour to make a bush bread. The Wattleseed is the a 'hero' of Australian Bush Food due to it's high nutritional content and is rapidly gaining increasing popularity as an ingredient in cosmetics and hair care due for its essential fatty acid profile. NATIVE EXTRACTS infuses the Wattleseed with Australian origin Grapeseed Oil oil to capture the Wattleseed's fatty acid profile. The Wattleseed oil-infusion delivers powerful skin nourishing, skin regenerating, wound healing, acne support and hair growth benefits. High in Linoleic Acid it is ideal for acne, irritated skin and inflammation. Introducing the NATIVE SEED OILS and INFUSIONS range, a new palette of fatty acid sources to create new stories, points of differentiation, market trends and branding for anti-aging skin care, hair care, treatments, cleansers, lip gloss and more. Discover one of the last frontiers of pristine untapped mega-diversity and explore the innovative formulators new tool box of unique and powerful phyto-actives that Australian species offer.